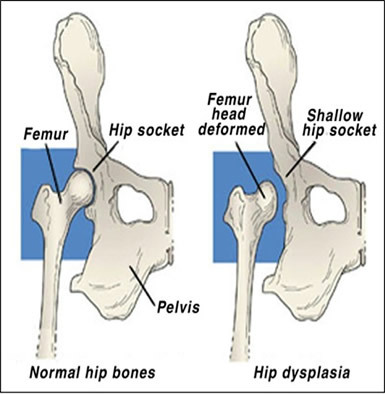 Hip dysplasia is an abnormal formation of the hip socket that, in its more severe form, can eventually cause crippling lameness and painful arthritis of the joints. It is a complex genetic trait (involving several genes) which can be made worse by environmental factors such as a dog being overweight or having inappropriate exercise. The thigh bone (femur) is connected to the pelvis at the hip joint. The round shaped head of the femur (caput) fits into the concave socket of the pelvis (acetabulum). The femur and acetabulum are both covered with cartilage to ensure a smooth and snug fit and wide range of movement. In a dysplastic hip the caput is not deeply and tightly held by the acetabulum so instead of being a tight fit it is a loose fit. Also the caput and/or acetabulum are not smooth and round but are misshapen, causing abnormal wear and tear or friction within the joint as it moves. The joint becomes inflamed and a cycle of cartilage damage, inflammation and pain begins, getting worse over a period of time. As canine hip dysplasia is a painful and debilitating genetic condition affecting many breeds, it is a ‘no brainer’ that only dogs with good hips should be used for breeding. In 1983 in the UK the British Veterinary Association and Kennel Club (BVA/KC) launched its official hip dysplasia scheme whereby the hips of potential breeding dogs are X-rayed and awarded a score. The lower the score the less degree of HD is present. The best score for each hip is 0 and the worst 53, giving a range for the total score of 0 – 106. A dog’s hip score is the sum of the score for each hip divided by 2. The breed mean score is calculated from all the scores recorded for a given breed and reflects the overall HD status for the dogs scored in that breed. The aim is to breed only from dogs which have a score lower than the breed mean score, thus gradually reducing the severity of hip dysplasia in the breed. Unfortunately this scheme, now in operation for more than three decades, has had only limited success. This is because it is a voluntary scheme and only a small proportion of dogs/puppies in affected breeds are scored. Breeders can ignore the scheme and still register their puppies with the Kennel Club. Various experts in the past have urged the Kennel Club to enforce the scheme in order to spare the suffering of so many thousands of dogs but the KC maintains its stance that it would be wrong to force breeders to health test. More recently members of the KC’s Assured Breeders’ Scheme (ABS) are either ‘required’ or ‘recommended’ to hip score their breeding dogs. However this represents a very small proportion of breeders (<15%). A further complication and disincentive for breeders to use the HD scheme is due to the complex nature of the disease. Unfortunately it is possible to breed from two dogs with good hips (low scores) and still produce some offspring with a more severe form of the disease. The scheme is not fail safe. In the US a better scheme is in operation known as PennHIP. The system uses three separate radiographs and is a more reliable measure of hip laxity. It shows a clear relationship between phenotypic (physical) measures and later signs of osteoarthritis. One advantage of the BVA/KC scheme is that over the years a huge amount of data has been collected by the Animal Health Trust (AHT) which can now be used to calculate estimated breeding values for HD in those breeds which have participated in the scheme in sufficient numbers. EBVs are a more accurate way of measuring a dog’s genetic risk, than by using the scores from the BVA/KC scheme alone. EBVs take into consideration a dog’s hip score as well as the scores of all their relatives. A dog’s EBV is either a positive or negative number with the breed average set at zero. A negative number means the dog has a lower genetic risk of disease than the breed average. A positive number indicates a higher than average risk of disease. By using all the data in a dog’s pedigree, EBVs are available for all KC registered dogs (of the above breeds) regardless of whether the dogs themselves have been hip scored. Each EBV is accompanied by a confidence value which ranges from 0 to 100. The EBV is an estimate of each dog’s genetic risk for a condition, while the confidence value shows how close to the dog’s true genetic risk the EBV is likely to be. The more data from the BVA/KC scheme that is available from an individual’s pedigree, the more accurate the EBV will be and the more confidence there is in the estimate of genetic risk. EBVs are not an alternative to hip scoring as the scores provide the data which the EBVs are based on. The EBVS become more accurate as more data is provided. EBVs mean that greater improvements can be made in selecting dogs for breeding.